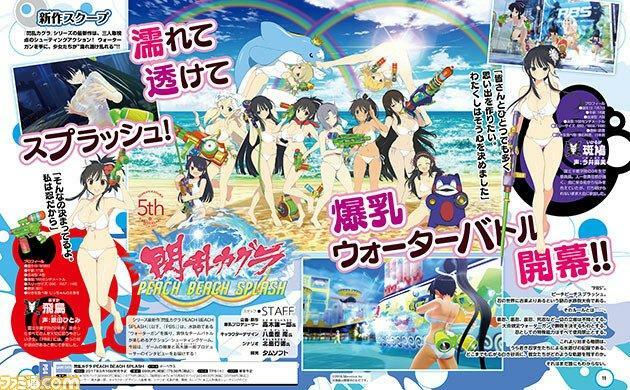 Senran Kagura: Peach Beach Splash, the next installment of the Senran Kagura series, was officially revealed by Famitsu and is due to be released on March 16th, 2017 for the PS4. 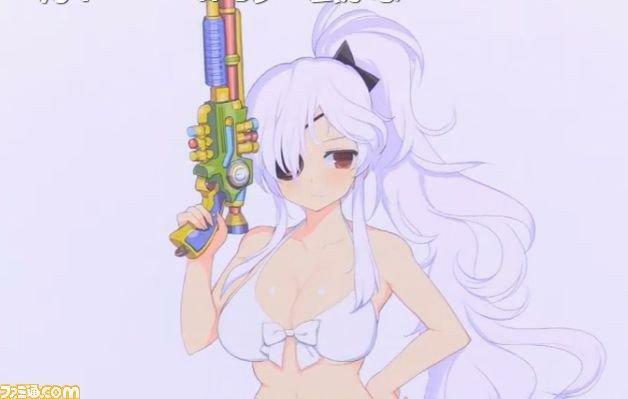 The story of the game follows the usual Senran Kagura cast into the titular Peach Beach Splash, a mysterious water gun tournament held since ancient times in the shinobi world. It is a tournament open for both Good and Evil Shinobi, in which special abilities are forbidden and victory must be decided by their water gun skills. The game itself will be a 5 x 5 team-based Third Person Shooter, featuring a story mode and online multiplayer. Players will be able to choose between 30 characters and several types of water guns, such as dual pistols, gatling guns, and sniper rifles; their skills and special moves will be set by a card system. The series’ signature finishing techniques will also be present and are said to be “powered-up” even further. - – Senran Kagura Peach Beach Splash‘s story is set in the main storyline of the series and there are plans to continue expanding on it. - – There are already plans for a new action game in the series. - – Some of the most popular characters from the series’ social card game, Senran Kagura New Wave G Burst, will be appearing in the new game. - – We want to ultimately converge the entire series into one big world. - – Both seasoned veterans and newcomers to the series should be be able to fully enjoy the game. - – We are thinking about ways to let the players influence the costume breaking to some extent. - – The amount of costumes that can get wet has increased, and there are also plenty of swimsuits. - – There are plans to support PlayStation VR with some modes, which may be added by an update after the release. - – There are about 10 types of water guns. - – There are plans to add more story, characters and costumes via DLCs. We also want to do collaborations. Senran Kagura: Peach Beach Splash is slated for release in Japan on March 16th, 2017 for the PS4. It will be available in the usual regular and limited releases, as well as a special “Very Limited Nyuu Nyuu 5th Anniversary DX Pack” that will include the game, a special product card, a Nyuu Nyuu mousepad of Yumi, a special illustrated box by Nan Yaegashi, an artbook, soundtrack, and a special 5th Anniversary Commemoration Blu-ray containing the previous animated openings of the series. For more news on Japanese gaming, be sure to follow us on Twitter and Tumblr. If you enjoy our work and would like to support us, please consider donating to our Patreon.